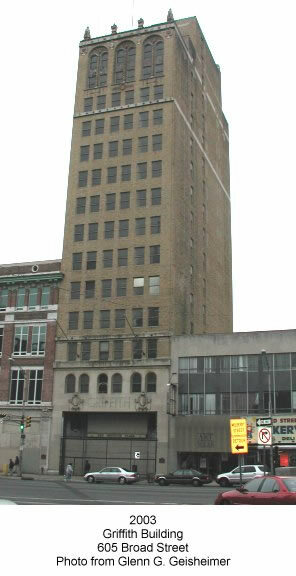 Hardly anyone gives a second thought anymore to the towering old faded hulk of a building on Newark's Broad Street with the word Griffith carved over the entrance, the doors locked and the 17 floors vacant and wrecked. You'd never know that from the late 1920s to the late 1950s it was a high-priced address for professionals, a bustling architectural jewel that was the headquarters for the Griffith family, sellers of pianos, organs and other musical instruments in a time when no home was complete without one. More importantly, it was the beating heart of music and culture in New Jersey, home to the Griffith Music Foundation, the phenomenal creation of one woman who almost single-handedly put the state on the map in the world of classical music. Lena Donaldson Griffith -- more commonly known as Mrs. Parker O. Griffith -- made Newark a destination city for the most famous musicians and artists of the day -- names like Toscanini, Rachmaninoff and Bernstein. The money behind such endeavors was the Griffith Piano Co., co-founded by her husband. "Mrs. Griffith's name was synonymous with the best music in America," said William Dane, supervisor of special collections at the Newark Public Library. Retired Newark banker Donald Karp put it more succinctly, comparing the influence of one woman to Newark's modern performing arts venue. "She was NJPAC," he said. As amazing as she was, it is equally amazing that Mrs. Griffith has been so completely forgotten. In this, the 50th year since the foundation shut its doors, there is no plaque to mark what went on at the building across from Military Park; no events are scheduled to mark its passing. The building is on the National Register of Historic Places, but nothing has been done to save it.